Want to support a specific trip, event, or fund? Raise money for your cause with the amazing guide found in our Fundraising Manual! 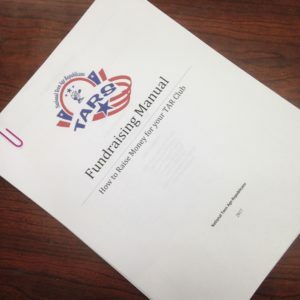 This amazing guide is chock-full of incredible tips on how you can effectively raise money to attend the TAR Leadership Conference, as well as provide for any other project your Club is supporting. From candy box sales to crowdfunding and more, you will find plenty of opportunities to raise money in the 21st century. Request your copy today! Just complete the form below.